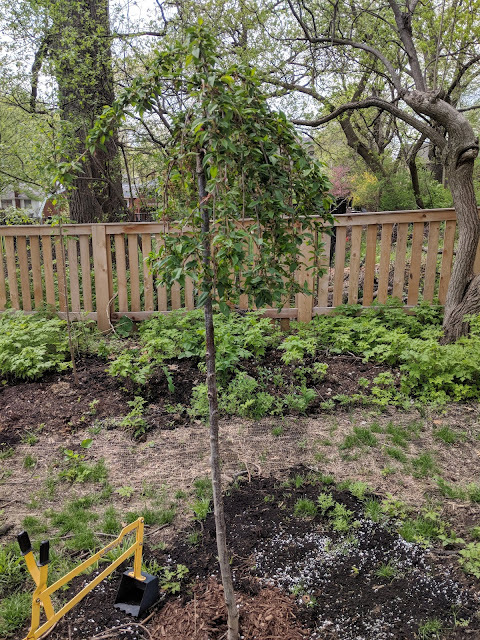 Here is the third of three Earth Day 2018 trees, but this one, while bought on Earth Day, wasn't planted on Earth Day. The Babe picked this one (for reasons I'll describe), but couldn't decide on the location at first. So it sat on our patio, in the pot for a couple of weeks. Reminder...the other two Earth Day trees from this year are a Red Maple Sun Valley tree that we planted all the way in the back and a flowering pear tree that we planted on the south fence line. 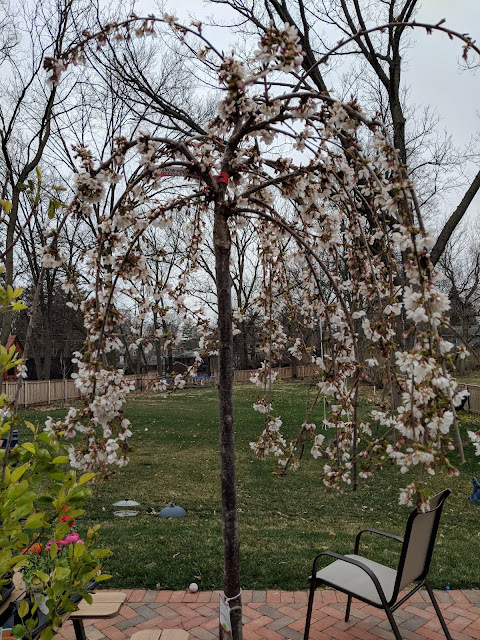 This tree is a flowering cherry, but different than our Kwanzan flowering Cherry as this one is a grafted tree that weeps. 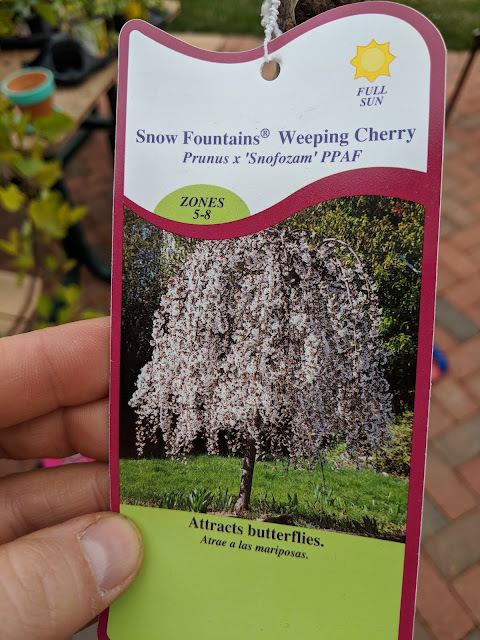 Pretty sure that this is a tree that - if not for a nursery - wouldn't exist normally. (Who knows...maybe no trees would??) It is smallish and will only get between eight and twelve feet tall and about six feet of spread. Here's the tag that shows the name Prunus x 'Snofozam' PPAF. Also note that it says "attracts butterflies". And that was what attracted the Babe. We had just come home from Epcot's Flower and Garden Show and spent some time in the butterfly booth, so she wanted to foster that kind of environment. We ended up planting this tree pretty much in the middle of our yard from side-to-side and about twenty feet from the rear fence line. This area hasn't been touched yet in our landscaping, but will be in the next few seasons as we work our way back there. The Kotbt helped plant this and you can see his 'digger truck' parked next to the tree that he used to help excavate the hole. We applied some mulch on top to keep the root ball from drying out this summer. Like the other trees, this one, too, isn't on our landscape plan, so we're kind of just winging it. 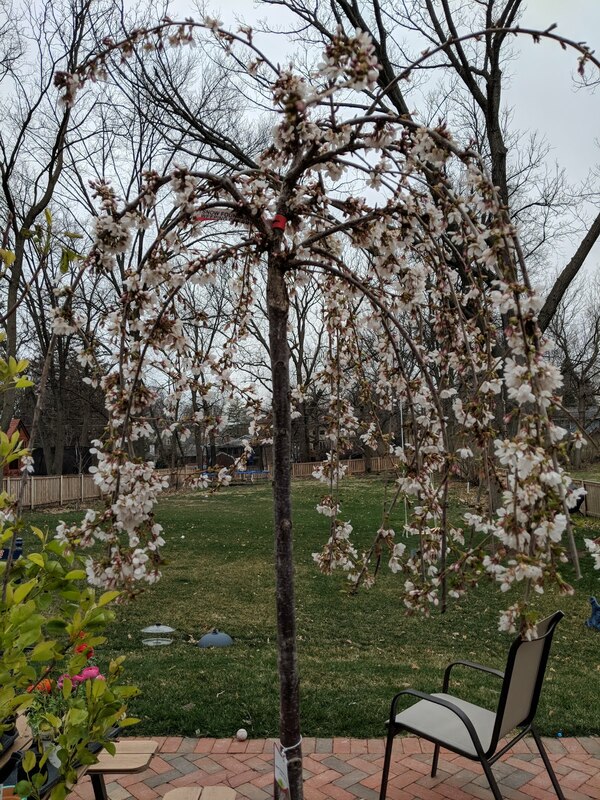 Once we work our way back there, I'll incorporate this into the bed and surround it with plantings and if this tree survives, will be more mature when we get to it. For now? It is kind of out on an island.